The story of William Tyndale is one of danger, power, and faith in this historical drama showing how a Bible defied a king. Want to discover the true story of a Bible pioneer? 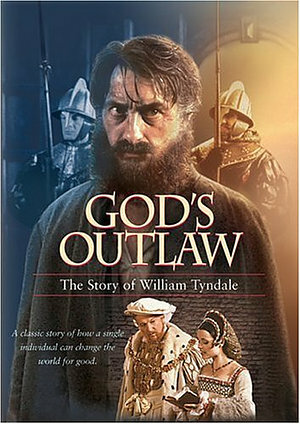 God's Outlaw DVD tells the story of William Tyndale who set out to translate the scriptures into the common language of the English speaking people. John Wycliffe first translated the Scriptures into English in the fourteenth century from Latin. But his hand-copied Bibles were burnt by the authorities. A hundred and fifty years later, William Tyndale set out to give the Bible to ordinary folk in the common tongue - this time, from the original Greek and Hebrew. But this was illegal and he fled to Europe pursued by agents of Henry VIII. Nevertheless, Tyndale's translation was mass-produced on the newly invented printing presses and smuggled into England. Eventually, betrayed by a friend, he was arrested, tried and executed. His eloquent translation was a priceless gift to all English speaking peoples and a fitting memorial to his courage and genius. An award-winning dramatic film with a distinguished cast led by Roger Rees as William Tyndale, Keith Barron as Henry VIII, Oona Kirsch as Anne Boleyn, Willoughby Goddard as Cardinal Wolsey and Bernard Archard as Sir Thomas More. A Grenville production with Channel Four, directed by Tony Tew. God's Outlaw - The Story Of William Tyndale DVD by Grenville Media was published by Grenville Educational Media in September 2014 and is our 11036th best seller. The ISBN for God's Outlaw - The Story Of William Tyndale DVD is 5034646986218. Be the first to review God's Outlaw - The Story Of William Tyndale DVD! Got a question? No problem! Just click here to ask us about God's Outlaw - The Story Of William Tyndale DVD.